Honda is another carmaker focused on supplementing the driving experience with an emotional, AI-based component. The NeuV, Honda’s latest concept which it unveiled at CES on Thursday, is a city-friendly lightweight electric car that has Honda’s Automated Network Assistant (HANA), built with SoftBank, on board to help personalize the driving experience. Through HANA, the car becomes aware of a driver’s emotions and moods, and can support driving choices as well as suggest media do other infotainment options. NeuV has other tricks up its sleeve, too. The all-electric vehicle is designed to answer the issue of idle vehicles, which is most cars most of the time, according to recent studies, that show up to 96 percent idea rates for vehicles where they’re just sitting in driveways or otherwise parked. NeuV is designed to operate as apart of an autonomous ride sharing fleet, letting owners generate revenue from their vehicles when they’re not in use. Another way NeuV can recoup costs is by managing electric power consumption from the grid, by intelligently monitoring electricity rates and charging only when it makes sense to do so from a cost perspective. NeuV is designed not only to only charge when rates are low, but also to actually sell back excess power it has stored to the grid during peak price times, which can actually help a user get an even better deal when purchasing that power back at low points. It’s sort of like your car is its own electricity market AI economies trader. Honda also build digital payments into NeuV, allowing prepayment on the road for goods and services via bank account or Visa. There’s even an electric longboard in the back for last-mile transportation, making it easier to get around both inside and outside the car. The outside design of the car is also unique, with doors that only extend about 20 mm beyond the frame of the car, and then pivot upwards to a 90-degree angle. This helps make sure the doors are accessible even in the tightest spaces, and has the added benefit of making it possible to build a very low step for entry with a full, unobstructed entryway for loading cargo and for getting in and out of NeuV. NeuV’s exterior is also mostly semi-transparent glass, with underset lights that disappear when turned off. The surface of the car is designed to be reflective, so that it takes the surrounding environment and displays it back to observers, helping the NeuV feel like a more natural part of its surroundings. Hana is at the center of NeuV, explains Nick Renner, a designer at LA-based Honda Advanced Design where the concept was created over the course of the past 18 months. 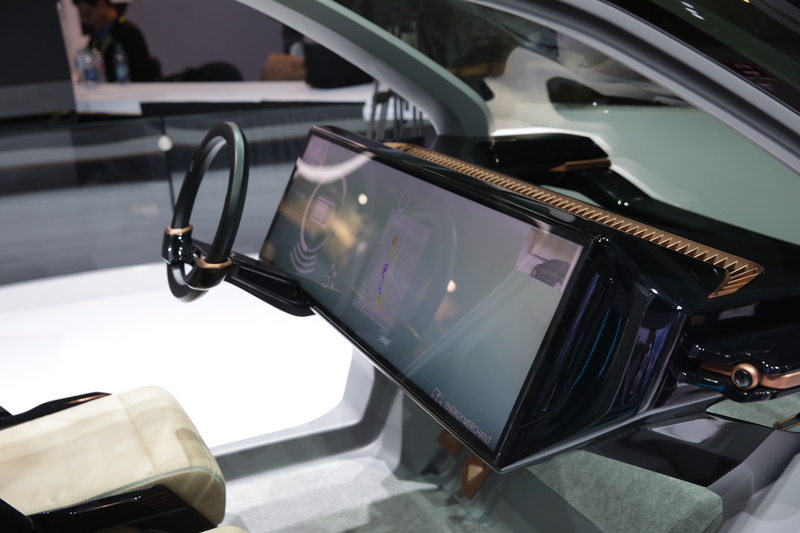 The AI assistant occupied the car in many ways, but a driver’s primary interaction with it will be via a huge touchscreen that replaces the instrument panel entirely. It’s visible to the driver through the steering wheel, too, so that they can get contextual information at a glance easily, basically no matter where they’re looking. NeuV is just a concept, Honda stresses, and there’s no sense of whether it’s intended for production or when. The car has a lot of tech that Honda is working on for production vehicles and likely eventual deployment, but for now it’s just a glimpse at what could be, given the state of advances in AI and other transportation tech. It’s also interesting that NeuV is making its debut at CES along with Concept-i, Toyota’s concept vehicle that also has an AI onboard, and where Ford debuted Alexa in its own vehicles. Sounds like a future where cars also pack on-board assistants is inevitable.